This is an In Person signed Colour 12" x 8" photo by the Irish National Hunt jockey best known for winning the 2012 Grand National on Neptune Collonges. Daryl Jacob is an Irish National Hunt jockey who rides for trainer Paul Nicholls as second jockey to Ruby Walsh. 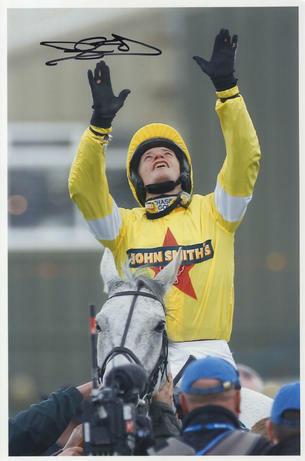 Jacob is most noted for winning the 2012 Grand National on the grey Neptune Collonges. The pairing beat second-place Sunnyhillboy in a photo finish and the closest ever finish to a Grand National.